How much does it cost..?! Review How much would you spend on a gaming PC? Alienware hopes the answer is ‘about four grand’. It has delivered a colossal gaming PC with two AMD ATI Radeon HD 3870 X2 graphic cards, but does the machine's performance match its price? We’ll get on to the CrossFireX graphics in just a moment, but let’s start with the cosmetic appearance of the Area 51 ALX CFX. 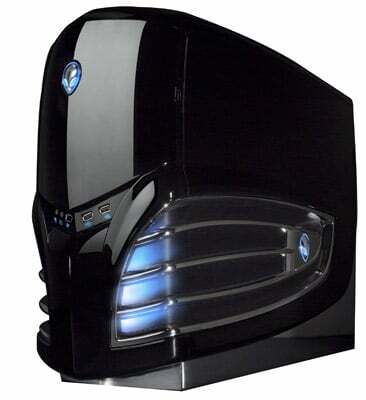 Alienware is big on the space theme, so the chassis is available in either "saucer silver" or "space black". The alien face on the front of the case doubles as the power button, and the logos on the front and side of the case are illuminated. Alienware's Area 51 ALX CFX: out of this world? When the PC is running you can use the bundled AlienFX Editor utility to change the colour of the LEDs in five case zones independently of each other. It sounds incredibly naff and cheesy, but it works surprisingly well. The front of the case has one Firewire and two USB ports along with jacks for your headset, and above that there's a door that covers the optical drive. The drive bay flap is an impressive piece of engineering that operates on a pair of articulated arms so the door pulls forward before it swings to one side. Unlike the door on a typical PC case that is usually just a flimsy piece of plastic, the Alienware door is quite substantial. Inside the case, the Area 51 looks fairly conventional. There are three optical drive bays at the front, with an LG GSA-H55L 20x dual-layer DVD writer at the top, an empty bay under that and a card reader in the bottom bay.